Marie Antoinette was perhaps most iconically known for her sense of style. 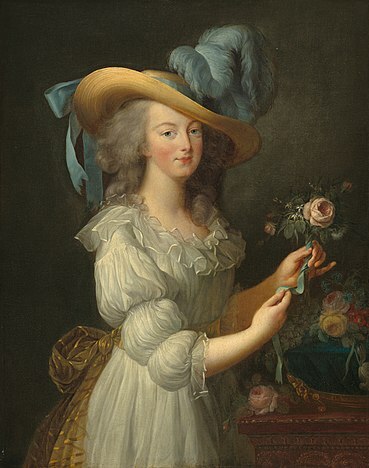 Although many of the ideas of French fashion we associate with her—the elaborate gowns, towering wigs, and fanciful headpieces—were already in place at Versailles by the time she arrived on the scene, she did take some of the concepts to new heights and bent the rules to make her own way. But she wasn’t always as chic as we have come to regard her. When fourteen-year-old Archduchess Maria Antonia first crossed the River Rhine and arrived at the border of France, she was dressed in the Austrian fashion. The fabrics and cut of her gown were luxurious and very expensive, but Austrians had the reputation for being much more staid and businesslike than their French counterparts. Although the young archduchess was the offspring of the Holy Roman Empress and considered a Daughter of the Caesars—the most high-born of European royalty—she was still looked upon as provincial by the sophisticated French. The first thing they did, before even allowing her to cross into their land, was to strip her of all things Austrian—undergarments, jewelry, hairpins, etc.—and dress her à la française. This meant that nothing from her homeland was to cross into France with her, even her little pug Mops. 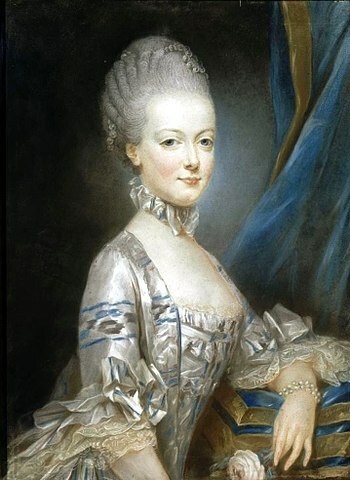 All of her former belongings were left on the Austrian side of the border, and Maria Antonia, clothed, made-up, and with her hair dressed according to the customs of Versailles, emerged on the French side of the line of demarcation as Dauphine Marie Antoinette. Although this process was meant as more symbolism than fashion statement, she now looked the part of first lady of the most stylish court in Europe. Anyone who has dealt with a finicky daughter knows what it’s like to go through several changes of clothing in one day. For the new Dauphine, though, it was not persnicketiness but a necessary evil of her position. There was a huge difference between the stylish new gowns she desired to wear and being dressed appropriately for her state duties. 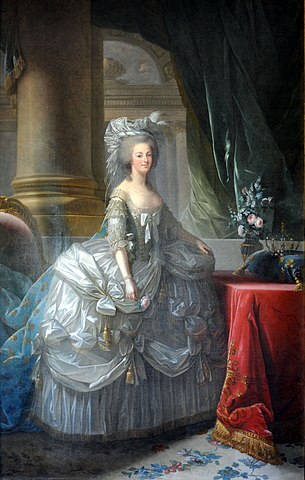 When Marie Antoinette woke in the mornings, she went through the steps of her lever–the everyday toilette routine of her rising–during which she was dressed somewhat informally for the pre-noon activities she could not accomplish in her dressing gown. At noon, she went through the process of Chambre–her formal toilette–during which she applied her make up and donned her official court gown in front of whomever had been admitted to Versailles for the day. These court dresses were very different than the regular gowns in fashion at the time. They were made with heavy traditional fabrics—brocades, satins, and laces—and trimmed with excessively ornate accessories—tulle, bows, tassels, and trains. You name it, it was thrown on there. The panniers required to hold these confections out to their best advantage were nearly twice the size of the ones worn under everyday dresses. There are accounts of women having to enter rooms sideways to accommodate their gowns. The necklines were low-cut and revealing, and the tightly fitted bodices—which lent even more contrast to the bell-shaped skirts—required a corset to be worn underneath. This seemed to be one of the things that Marie Antoinette objected to the most. There are letters still in existence today in which her mother chastised her over and over again for refusing to wear her corset. When Marie Antoinette became Queen of France, along with her subservience to her elders, her corset was one of the things she cast aside in the name of her newfound independence. This was also when her relationship with Rose Bertin began in earnest. As Dauphine, Marie Antoinette frequented the dressmaker’s fashionable boutique and occasionally sent for her to come to Versailles. 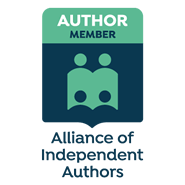 Now they began a more regular association. The couteurière packed up her tools of the trade twice a week and trundled them to the new Queen’s apartments to plan their creations for whatever the upcoming schedule of events had in store. Marie Antoinette also designed many of her own fabrics, usually a light background embroidered with light and airy floral patterns. This custom needlework found its way into Rose Bertin’s designs and many accessories of the Queen’s personal habitations. There were chairs, draperies, even silk wall panels and tables made to her specifications. Working with the Queen’s hairdresser, Léonard, Mademoiselle Bertin also designed custom poufs—the inner pads and cushions—that supported the towering hairstyles of the time, some of which measured over three feet tall. Although wigs had been a required part of the costume of Versailles since its inception they literally reached new heights during the reign of Louis XVI and were cunningly sculpted to celebrate current events, one of the most famous commemorating the King’s inoculation against smallpox. Shortly after Louis XVI’s coronation, he gifted his Queen with le Petit Trianon, which became her personal escape from the rigors of her position. Along with discarding the strictures of etiquette, she also put away the detestable corset and opted for simpler gowns that did not require one. Of course there were still state occasions when she had to revert to the overdone court dresses, but left to her own devices, she resorted to the comfort and easiness of poplin, muslin, tulle, or cotton lawn topped with a straw hat to complete the look. She even had a portrait painted dressed in this same simple manner. 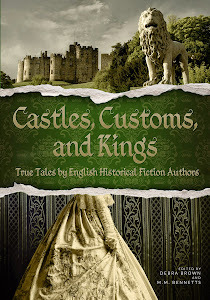 It sparked an unforeseen controversy, drawing nasty remarks ranging from outrage from courtiers at the Queen being depicted in her nightgown and diminishing the standing of the royals, to the common folk clamoring against her ‘playing at’ being a peasant. Although innocently done, many such unwitting blunders contributed to the disparaging of her character and the vilification of her public image, in part, leading to the downfall of the monarchy and the rise of the French Revolution. As the Austrian party looked on, the teenager was summarily stripped and every last vestige of her homeland discarded. Even her little dog Mops was removed from her possession, and she cried out in surprise in her upset. Finally she stood there, naked and trembling without even her shift to shield her. She brought her hands up to cover the most feminine parts of her anatomy as a sour-faced woman, in charge of her transformation from Austrian to French form of dress, began an impersonal and meticulous inch by inch inspection of her flesh. Antoine tried to keep her disdain from showing. Was this painstaking process really necessary with so many people in attendance? Surely this part of the ceremony could have been accomplished more quickly and privately. The thought occurred to her that she had probably not been so closely examined in the moments following her birth. It was said that her mother had only paused her paperwork long enough to push Antoine into the world then resumed her signing of documents immediately after. The picture was a silly one and produced a reflexive giggle from the fourteen-year-old, already discomfited over standing so exposed before a roomful of onlookers. The woman interrupted her prodding to shoot the Austrian girl a reproving glare, mistaking Antoine’s amusement for contempt. She cleared her throat audibly and went on to explain in a haughty tone. 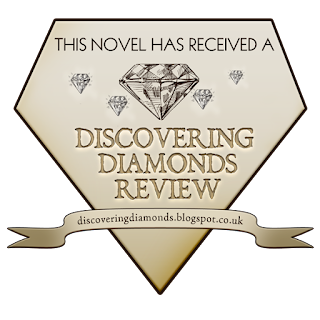 Antoine turned and glanced over her shoulder to see what the woman had discovered to provoke the comment. 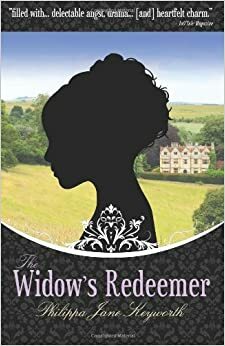 The view of the woman’s dark eyes peering out over the curve of her bottom was almost more than she could bear. Her lips quirked to one side as she stifled her rising giddiness, reluctant to incur another reprimand. “Yes, it would be terrible for you to get infected,” the woman said enigmatically, looking up at her charge out of the corner of her eye. But she was still not convinced. “Are you certain? It is shaped somewhat like a bite mark,” she insisted, manipulating the flesh of the surrounding area, making sure it showed no signs of recent infection, no discoloration or seepage. “My brothers may have been rough with me on occasion, but I don’t recall them ever biting me,” Antoine remarked wryly. Especially on my behind! she added to herself. She shivered in her state of undress, wishing the woman to be done with the inspection and get on with the job of dressing her. When she had imagined herself as the Queen of France, this had not been a part of the vision. It was decidedly unlike the fairytale she had conjured. Eventually the woman seemed to have satisfied her misgivings and called for the fine French linen chemise, which she settled down over the girl’s head with her own two hands. Her part accomplished, she signaled for the other ladies to bring forth the remainder of the garments necessary for the transformation. Then she sat back to make sure they performed the task to her exacting standards. Finally, the Austrian girl was dressed à la française to the satisfaction of the woman in charge and stood waiting for her next cue. Antoine began the process almost gaily, testing out her new persona with alacrity, buoyed by the beautiful French gown and elaborate new coiffure with its glittering adornments. But as the realization set in that this was probably the last time in her life she would see these staid, upright Austrian nobles, so representative of her native soil, she began to sniffle in sadness, dreading the final separation. By the time she reached the end of the line and her carriage companions stood before her, equally as miserable, the tears were flowing in an unstoppable stream. She clung fast to the princesses, knowing that as soon as they released each other, their connection would be severed in fact as well as principle. As the last of her Austrian entourage vacated the room, Antoine was immediately set upon by the French attendants, who dried her tears and attempted to repair the damage to her meticulously applied maquillage. They wiped away the black smudges under her eyes and the streaks on her cheeks left by her tearful farewells. They dabbed white face paint over the bare patches followed by powder and rouge and relined her eyes with kohl. When Antoine was once again presentable, one of the friendlier girls drew close and made a show of neatening her hair. “Thank you,” Antoine whispered back with a meaningful look. Thank you so much for hosting me, sweet Philippa! You were a dream to work with, and your enthusiasm is heartily appreciated! You are so very welcome Ginger! Thank you for such a fantastic post, Ginger! 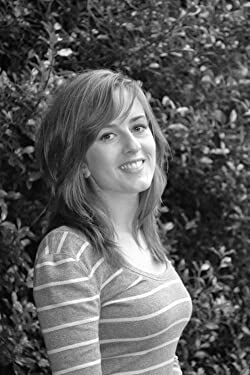 I will be picking up a copy of your book for my Kindle and can’t wait to devour it! Congrats on the release!